I know, I know; that’s not fair to the French. Not fair at all! But how’s a humorist like me supposed to make an easy joke without sweeping generalizations and broad stereotypes? Actually, it might be true for Parisians, that they look down on you for even attempting their language. I’ve had that experience more than once. But it’s not true of all Frenchfolk. Traveling through Bordeaux, for example, I noticed that the locals were visibly relieved to discover that I spoke even a little French. They’d much rather hear me butcher theirlanguage and nod politely than be forced to wrack their brains and wrap their tongues around English, that filthy upstart lingua franca (“eh, that title belongs to us!” the Frenchfolk cry. “Come on, it even has ‘franc’ in the name, pour l’amour de Dieu!”). In Paris, though, their English is usually good enough that they’d rather not talk to you at all. In Germany, particularly in the cities, their English is so good that it takes a real force of effort not to get them to switch to English. For day to day encounters lasting under ten minutes, such as the cell phone store or the dentist’s, this is almost impossible. By asking a person who knows you speak English, and who can also speak it fluently (or even better than you can) to humor you as you stumble through their language, you are literally making that person’s day a little bit worse, and they don’t hide that expression on their face. However, if you have German friends – not hard, they’re generally quite friendly if you’re not jaywalking or two minutes late – you can just ask them politely to speak to you in German, and they’ll be forced to, because they’re your friend. Also, they get it. They were learning too, once. Really though, Italians seem tickled pink that you’re speaking Italian, and as they’re a talky bunch, you’ll never be at a loss for topics of conversation: food, what they’re eating, what they’ve eaten, what they’re going to eat, what they should eat, what would be better to eat, and suggestions for places at which to eat. Plus, Italian sounds good whether it’s right or not. In French and German, if you speak it wrong, it sounds wrong. It grates the ears. A faerie dies every time you do it. In Italian, you can just make stuff up and it sounds absolutely delightful. But that’s only my very limited experience. 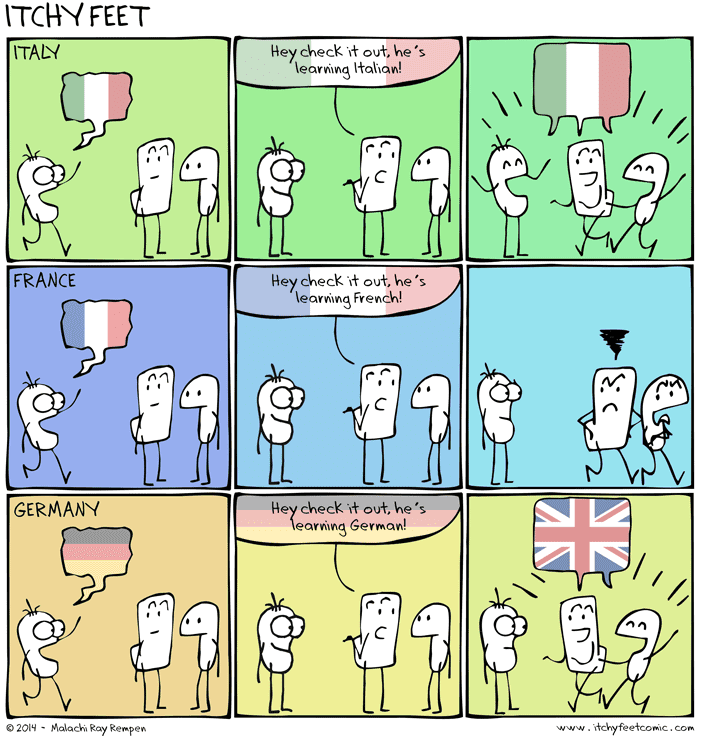 What I’m interested in is your experiences; I’d really like to do another version of this comic with a bunch of other languages. I’ve heard Scandinavia, the Netherlands and Israel are very similar to Germany, in that their English is far too good. I’ve heard in Asia, the better you are at their language, the more suspiciously you’re regarded. I’ve heard that in Central and South America, where accents are so easy to spot, you’re almost guaranteed to speak with the wrong one.